CiviCRM is a full featured database right out of the box, and has lots of ways to extend it. For example, you can create extra set of fields for certain types of contacts, and these can even have a one-to-many relationship. Here's how I ran a report on from this extended dataset. My example is taken from a charity client that provides physio to children. Children are the focus, but being children, the organisation deals mainly with their families/guardians. A field set was created to store the information required on children, which includes name and date of birth. 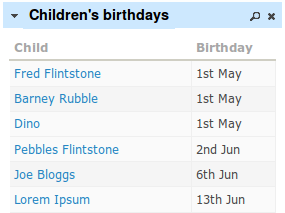 My client wants to make sure they remember children's birthdays, and asked for a report that showed up-coming birthdays. But if you don't know the table names, or the fieldnames within the table, it's more tricky. Add a hugely complex SQL abstraction layer and you get to something as obfuscated as seen below. The learning for me was about how CiviCRM handles and stores custom data. Note: these sub-records are referred to as [custom] groups in the PHP code, and as custom field sets in the interface. This caused some confusion because CiviCRM also uses the term groups to refer to lists of contacts. How to we bring in the custom field sets columns? This property tells CRM_Report_Form to work in all the SQL joins necessary for all custom groups. So even when the table and field names are obvious, you need to access them this way. Now the fun starts with the custom field sets' (custom groups') fields. When you create a custom field set a new table is created to hold the data. To find the name of the table you can either take a peek at the tables in your CiviCRM database, or use a lookup function (see my other posting: How to get table info on a custom group). I could get most of what I wanted through from the database query, but I really wanted the child's name to link nicely through to their guardian's contact record. For this purpose I included this contact Id in the SELECT clause, then used alterDisplay to replace the child's name field with HTML for the link. alterDisplay() also removes the fetched Id field as nobody needs to see that. Once the code was written, I registered the report type at civicrm/admin/report/register, then created a report, ticking the allow-dashboard box, and finally, added it to the dashboard. I have experienced some odd problems with using it on the dashboard, but these go away by clicking the Refresh Dashboard Data button. Further/preliminary reading: Note: I have not covered the foundation stuff here - what files go where. Take a look at the CiviCRM Wiki (4.3 version) [4.0 version] for a primer on that. * Nb. this report was originally based on a core CiviCRM report. *     There may be some unnecessary code left over in it. "<a href='$url' title=\"See child's guardian's record\" >"
Well written. Some of the functions could just go away (as you already mentioned) and would be called directly from parent class like - orderBy, groupBy, buildQuery, formrule ..
Do you still use this report? You posted this quite some time ago, have you got it working on more recent versions of CIVICRM? It would actually make a good core-report. I would love to try and use it in CIVICRM 4.6 for our church.